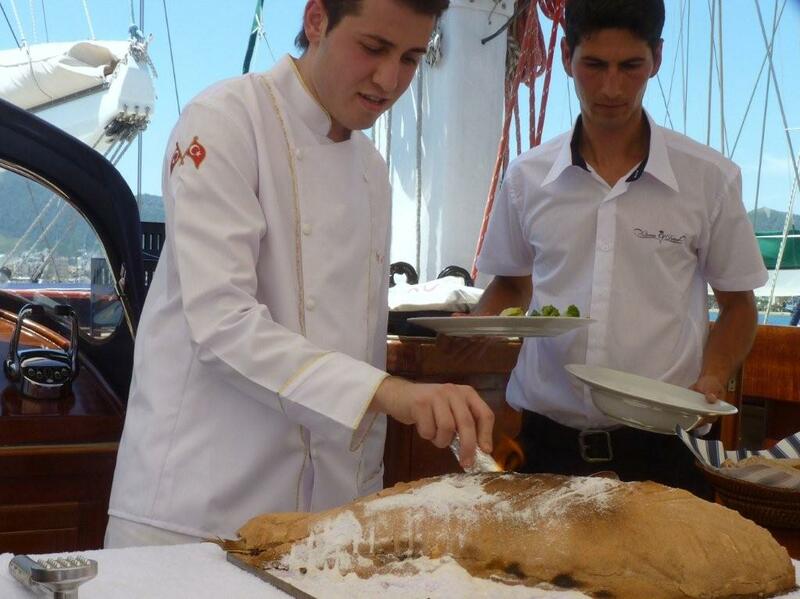 What could be more natural and tasty than a freshly caught Adriatic fish baked in a sea salt covering and served, where else….on deck on your Gulet charter along the southern coast of Turkey? Part of the cuisine of several countries, salt encrusted baked fish is often done in Turkey and is a delightful treat when anchored in a secluded harbor floating on turquoise colored waters. 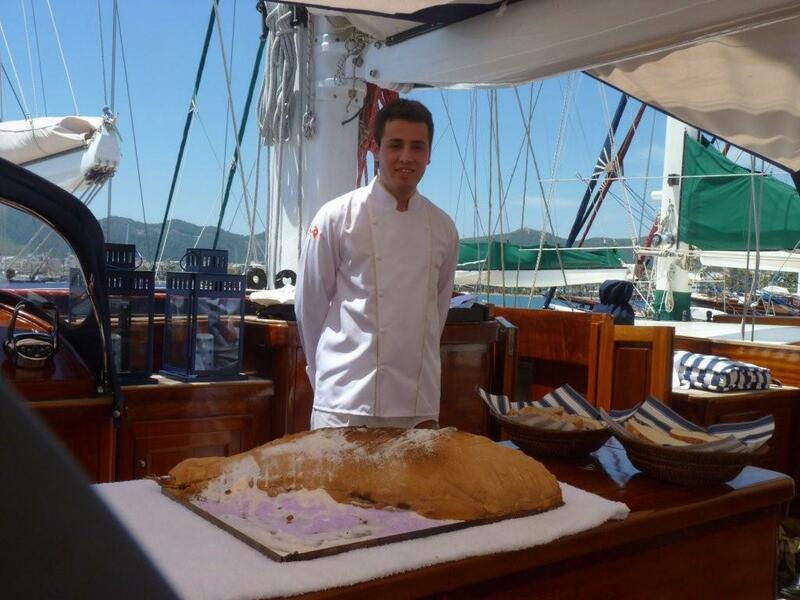 Recently on the 115’ Gulet Queen of Datca in Marmaris, Turkey, we were treated to this delicacy. Encased and baked in the salt, the fish retains natural moisture, while the salt absorbs any steam so that the fish bakes gently in its own moisture rather than being steamed. And the final presentation can’t be beat, as the fish comes to the table in its salt encasement, which is “cracked” with a flourish to reveal the moist tender fish inside. 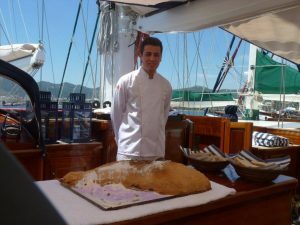 Making sea salt encrusted fish requires the freshest whole fish available, preferably right out of the sea alongside your Gulet. The ingredients are simple, one whole cleaned firm fleshed fish and about 2 pounds of sea salt. Place a thick layer of sea salt in the bottom of a roasting pan large enough to hold the whole fish, including the head and tail. Then mound the remaining salt over the fish for a layer that is about 1 inch thick. 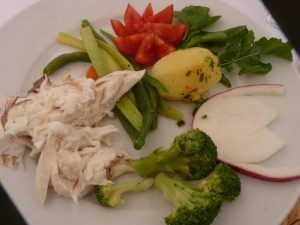 If wanted the fish can be placed to rest on fresh Turkish Bay leaves laid over the bottom layer of salt, and other local herbs and lemon can be placed in the cavity of the fish, but the fish just as is, baked in salt is lovely, beautifully fresh flavored and moist. Bake at about 400 for around ½ hour and then bring to the table, as is, with pan, fish and salt encasement. Some Chefs will light the exterior of the salt aflame for a browned finish to the salt encasement and to intensify the drama of the event. 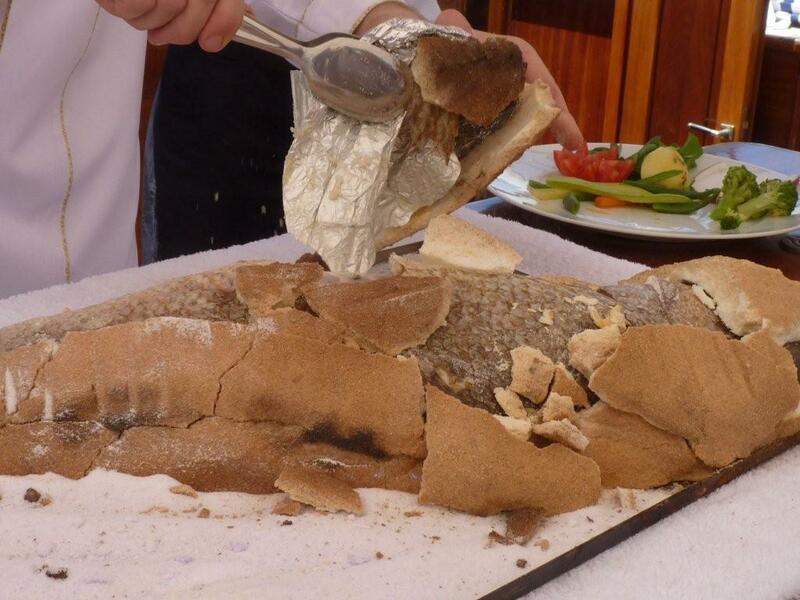 At the table, with a chisel and mallet, the Chef “cracks” or breaks open the salt encasement to reveal the freshly baked fish exuding natural mouthwatering aromas. It is hard to have fish prepared in a better or more natural manner than in baked in an encasement of sea salt.